If you are fan of a strong and consistently competitive teams getting out before a pair of not-as-capable teams, then last week was prime TV watching for you. If you are like the rest of us, then it falls into the "not so much" category. Kym & Alli didn't make a terribly bad decision (but as David pointed out in the recap, it was greedy) and likely all of us would've also opted for the Fast Forward with such a lead on the other teams. They just fell victim to a task that was tailor-made for another team to excel at. If the producers didn't expect us to see through this transparent move to keep the surfers in the race, then they really think little of us. Regardless of how I feel about it...what's done is done and it's time to move on with this week's rankings. 1) Adam & Bethany: The married surfers/Express Passers/Fast Forwarders have shown they have the skill, attitude and luck (or grace of God) to make it to the end. Aside from a couple of legs with slip-ups, they have left a wake of positivity and positive results behind them. Their everlasting support and encouragement of one another is refreshing in this type of competition. I could quibble over the fact that the producers have predetermined that the surfers should make it to the end with last week's suspiciously designed Fast Forward but I will no...oops...looks like I just did. If it had been a lesser team that hadn't proven their Race worth, then I really would have an issue with it. All that to say that the newlyweds deserve to win it all and likely will. 2) Misti & Jim: Team DDS had the advantage of the newly introduced Save sitting in their pocket the whole Race and it never actually became a thing so to speak. 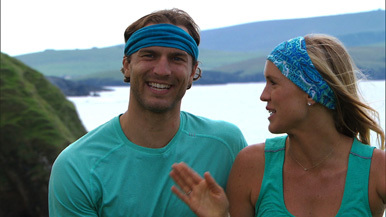 They didn't need it because they rocked most of the challenges and showed they were as competitive as Jim was confident, which is to say "extremely" on both counts. I would argue that the Save is a failed experiment and feel good about not letting it factor into my rankings. Back to the ranking rationale, we know that Jim thinks he is the dominating force on the team, but I have been impressed with Misti lately, especially with the rappelling task in Malta. She can hold her own with even the strongest of females on them race like the cyclists and Bethany, and it seems that Jim realizes and appreciates her for it, which is nice to see. On the race, I think Jim's hubris will be his downfall. They will think whatever decision he is making is the best one ever and be blind enough to other possibilities that the others will pass them (see last week's flights). The dentists have been a top team since the beginning and that remains the case.